On the mantle this week: daffodils and some new French style house signs, from here. I love the contrast between the yellow and blue and they way they pick out those colours in my rainbow garland. I appear to buy a bunch of daffodils every week at the moment. Well, they are only £1 and I don't feel too guilty about that kind of purchase, they really are the happiest-looking flower. It occurred to me that I do spend a lot of time fiddling around with our mantle piece, changing displays and arrangements, making it seasonal. Pottering. It is a pleasing blank canvas; a pale marble surround against a grey wall. Some might find it boring but I like the way anything can go there. A quick look back through my old photos revealed lots of images of this mantle at different times of the year. Pinks, greens and bulbs in the Spring. Stocks and some favourite souvenirs from Copenhagen in the Summer. Dried hydrangeas, seed heads and candles in the Autumn. And pieces of fir tree with stockings and stars at Christmas. And today it looks like this. Colourful. It's a constantly evolving display - artworks change, garlands come and go, favourite ornaments and objects are often up there for a week then moved again. It's where I prop new postcards or cards received through the post, or pictures the children have drawn. They sit up there to be admired until they move on to a more permanent home. If I need to photograph something for the blog I often clear a few bits from the mantle and place it here. The plain wall provides a good backdrop and the large south-facing window to the left of the fireplace gives good light on even the gloomiest days. I like tracking the seasons through my mantle piece. Do you have one? Is it an ever-changing display or honed to perfection? Or maybe not a mantle, but a favourite shelf, sideboard or table where you can create attractive displays and add some seasonal details. Fun, isn't it? 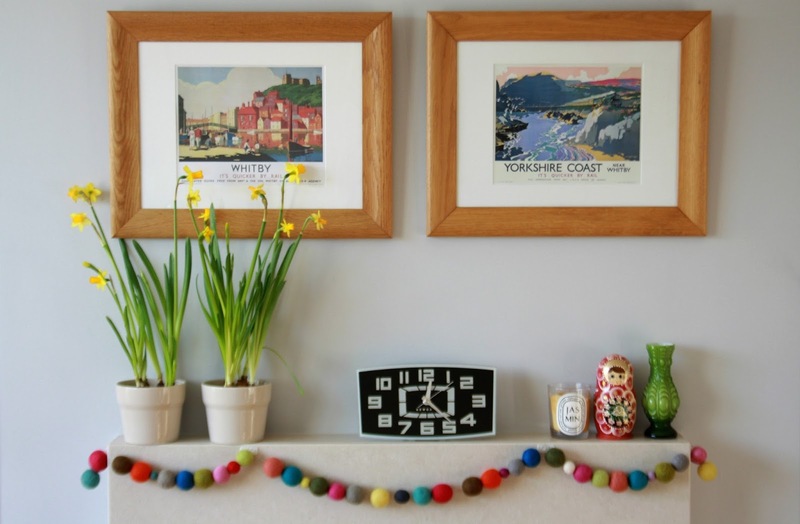 I love the changing seasons recorded via your mantlepiece, and the little people that were the header for the blog for a while. I am desperate to find something that will be my barometer as it were in the hall, I want a console type thing but I really want the objects on it to be the 'thing' not the furniture itself. Ikea did not have anything, might have to paint an old thing white. So pretty, every one of the arrangements. My dining room table is this way for me, I change the tablecloth, candles and centerpiece with the seasons. I wish I could get some fresh daffodils here, I hope they have them in the stores soon but haven't seen them yet. I love your plain marble mantlepiece. As you've said it's a wonderful blank canvas and you do make it lovely and seasonal. We have photos on our mantlepiece that we don't change but I like to alter the other things around them every now and again . At the moment we have flowers in an old coffee jar, candles and my new yellow eggcup. I love your mantle displays and now that I actually have one, may do the same sort of thing, though I am using the big formal lounge as my quilting room. The mantle is a bit of a dumping ground at the moment, but once sorted and settled, I will use it to display things, so watch for it on my blog occasionally. Take care. No mantelpiece for me so I am with Jennifer on the seasonal changes on the table. So looking forward to some love at Valentine snd Easter prettifying . Love the way you use the mantel to show the seasons. We had a mantle in our old house and I used to change it up (not quite as often as I liked). In our current place we have a built-in shelf in the lounge which I use to display pretty things - I must make an effort to use it to display the seasons. I LOVE your rainbow garland - did you make it? I love your seasonal mantle displays...so pretty, yet elegantly simple. I don't have a mantle, but I do enjoy changing up small areas of the home with each season. And I agree, daffodils are the happiest of flowers. It's lovely Gillian, a beautiful focal point. I have some bits which stay put, and some which come and go. At the moment - an old Arthur Ransome book with a beautiful cover, a candle and some feathers from summer adventures. Flowers and leaves are often there when I can find them. I hope you have a lovely Sunday. Love your mantle shelf, Gillian. My workroom is the ever changing space in our home, reflecting my mood and the ever changing landscape outside our front door. I would love a mantle, but have to make do with cabinet tops and shelves. Yours is so pretty and it is a lovely idea to change it according to the seasons. What clean, clutter free displays. "Pottering" - what a lovely English word! I don't typically have time for pottering and if I did have a mantle, it would be covered in woodstove ash. I have really enjoyed the Christmas bunting that I made for our kitchen window, and would like to make seasonal ones, so that can be my pottering. I would love a mantle to fiddle with, yours is delightful. I love my mantelpiece! It's only a floating shelf with a mirror over the top but I, too, am forever fiddling around with it and using it as a bit of a nature table. It looks very pretty and colourful. Your pottering is great! I love changing my mantlepiece with the seasons. I always look forward to doing the autumn one with cut out orange and yellow leaves, pine cones and gourds - it cheers it up before the Christmas decorations come out. At the moment it looks a bit wintery with some penguin candles and the kindness elves left over from the holidays: it really needs to be changed during half term. All your mantle displays are so lovely! We don't have a mantelpiece...but after seeing this post I wish we did! Loving what you do with your mantle - mine pretty much stays the same. Guess I should follow your lead and be more creative!! Your mantle always looks so pretty. I like the seasonal changes. I have one that I change around every so often. At the moment it has photos, a dried hydrangea head in a charity shop jug, a beautiful old clock which doesn't work but looks great, some paper snowdrops and a spotty vase full of origami lillies which are from my wedding. I have a rustic railway sleeper over my fireplace. I display, gifts that are special to me, 2 vases from Malaysia, a glass pot filled with cinnamon sticks, a bronze hare and a candle made in Orkney. Occasionally I have a move around but not that often. Your changing display on your mantle looks wonderful. I love every display here! I really love your sunny daffodils and rainbow garland... it all looks so happy and bright. I don't change around my mantle display often enough. I really need more accessories in our house. I do have a Valentine garland up there now, but some fresh flowers would also be really nice. Hopefully hubby will bring me some for Valentine's Day! So glad Bella is starting to feel better now. .. I hope you are also. Love, love, the bead creation with Alicia Polson's design. I lev in Portland, OR same city she does. She is a great artist and I love her work. Have a great week Gillian. Lovely photos, I do like the bird print.. I've only recently become the owner of a mantlepiece and I think it's a great idea to change it to suit the seasons / holiday or your mood. Love the prints you have of Whitby and Yorkshire, they're really cool!